Deal with included 30% OFF Coupon! 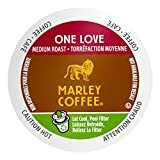 ENJOY A CUP OF MARLEY COFFEE: One box of 24 single serve One Love coffee capsules. Marley Coffee is WaterWise Coffee focused on improving water access, conservation and purity in coffee producing countries. MARLEY’S BLENDS: 100% Arabica Coffee. Medium Roasted. From the birthplace of coffee come the exotic taste tropical floral and berry notes of single-origin Ethiopia Yirgacheffe beans, excellent flavor – leaves you wanting more.